The study, led by researchers at the University of Cambridge, is a step towards developing personalised treatments based on a patient’s own skin cells for diseases of the central nervous system (CNS). In MS, the body’s own immune system attacks and damages myelin, the protective sheath around nerve fibres, causing disruption to messages sent around the brain and spinal cord. Symptoms are unpredictable and include problems with mobility and balance, pain, and severe fatigue. Key immune cells involved in causing this damage are macrophages (literally ‘big eaters’), which ordinarily serve to attack and rid the body of unwanted intruders. A particular type of macrophage known as microglia are found throughout the brain and spinal cord – in progressive forms of MS, they attack the CNS, causing chronic inflammation and damage to nerve cells. Recent advances have raised expectations that diseases of the CNS may be improved by the use of stem cell therapies. Stem cells are the body’s ‘master cells’, which can develop into almost any type of cell within the body. Previous work from the Cambridge team has shown that transplanting neural stem cells (NSCs) – stem cells that are part-way to developing into nerve cells – reduces inflammation and can help the injured CNS heal. A possible solution to this problem would be the use of so-called ‘induced neural stem cells (iNSCs)’ – these cells can be generated by taking an adult’s skin cells and ‘re-programming’ them back to become neural stem cells. As these iNSCs would be the patient’s own, they are less likely to trigger an immune response. Transplanting NSCs and iNSCs directly into the cerebrospinal fluid reduces the amount of succinate, reprogramming the macrophages and microglia – in essence, turning ‘bad’ immune cells ‘good’. This leads to a decrease in inflammation and subsequent secondary damage to the brain and spinal cord. “Our mouse study suggests that using a patient’s reprogrammed cells could provide a route to personalised treatment of chronic inflammatory diseases, including progressive forms of MS,” says Dr Stefano Pluchino, lead author of the study from the Department of Clinical Neurosciences at the University of Cambridge. Dr Luca Peruzzotti-Jametti, the first author of the study and a Wellcome Trust Research Training Fellow, says: “We made this discovery by bringing together researchers from diverse fields including regenerative medicine, cancer, mitochondrial biology, inflammation and stroke and cellular reprogramming. Without this multidisciplinary collaboration, many of these insights would not have been possible." The research was funded by Wellcome, European Research Council, Medical Research Council, Italian Multiple Sclerosis Association, Congressionally-Directed Medical Research Programs, the Evelyn Trust and the Bascule Charitable Trust. It isn’t every day that you find yourself invited to play croquet with a Nobel laureate, but then Cambridge isn’t every university, as Dr Luca Peruzzotti-Jametti discovered when he was fortunate enough to be invited to the house for Professor Sir John Gurdon. Dr Peruzzotti-Jametti began his career studying medicine at the University Vita-Salute San Raffaele, Milan. His career took him across Europe, to Switzerland, Denmark, Sweden and now to Cambridge. After completing a PhD in Clinical Neurosciences here he is now a Wellcome Trust Research Training fellow. His work focuses on multiple sclerosis (MS), an autoimmune disease that affects around 100,000 people in the UK alone. Despite having several therapies to help during the initial (or ‘relapsing remitting’) phase of MS, the majority of people with MS will develop a chronic worsening of disability within 15 years after diagnosis. This late form of MS is called secondary progressive, and differently from relapsing remitting MS, it does not have any effective treatment. 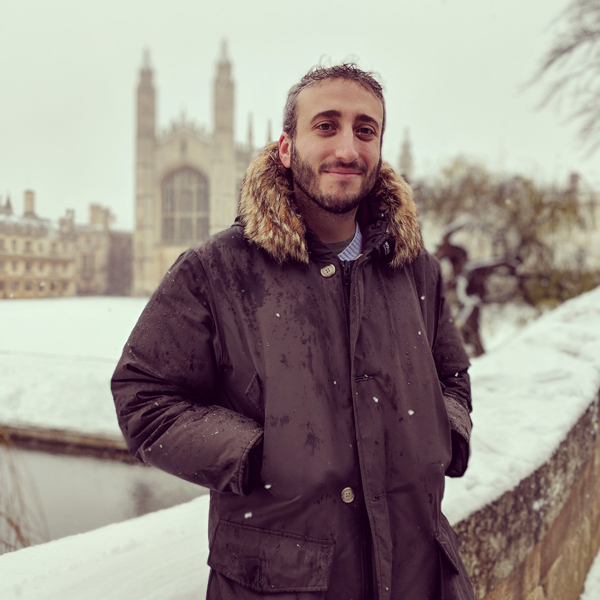 Dr Peruzzotti-Jametti is based on the Cambridge Biomedical Campus where he works closely with clinicians at Addenbrooke’s Hospital and with basic scientists, a community he describes as “vibrant”. “Cambridge has been the best place to do my research due to the incredible concentration of scientists who pursue novel therapeutic approaches using cutting-edge technologies,” he says. “I am very thankful for the support I received in the past years from top notch scientists. Being in Cambridge has also helped me competing for major funding sources and my work could have not been possible without the support of the Wellcome Trust.